Some cars are the best in their respective class and rightly get all the press. Others are poor offerings and no one talks about them. But some are just "pretty good" and even though they might not be your first choice they can offer a nice value for your money. Welcome to Lost in the Crowd...were I will highlight a model that doesn't get enough attention or sales but should be on your radar. The subject of this installment is the Dodge Dart. The Mazda 3 is the fan favorite if the compact segment, it has the looks, the handling and the features that make it an all-around-winner. However, the 3 can also get a little pricey; a fully loaded 2.5 Grand Touring will set you back almost 30k. My other major criticism with the 3 is if you want the more powerful 2.5L SKYACTIV, Mazda will not let you row your own gears. So if the budget is too tight for the Mazda, the Dodge Dart could fit the bill without breaking the bank. 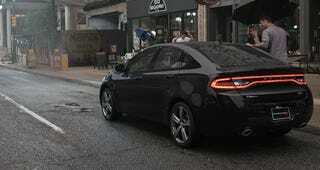 Because the Dart is not selling as well as Dodge expected, the brand is being pretty aggressive with the incentives. Jalopnik alumni, Alex Lloyd reviewed the Dart Rallye with the 1.4 turbo and found it to be a pretty decent little compact. The Rallye is fine, but the one you want is the Dart GT with the 184hp 2.4L TigerShark engine and starts at a shade under 21k. The GT does have some cool 18" wheels, "sport-tuned" suspension and steering, leather seats, touch-screen infotainment and a bunch of other goodies. And most importantly….you can keep $1250 in your pocket and get a 6-speed manual. A fully loaded will set you back around 23k. Use the 2000 customer cash or 0% financing and you can get your self a fun to drive, stylish, compact sedan with a little bit of Alfa DNA. Of course there are two major downsides, the above incentives expire on 6/2 (though I suspect Dodge will come out with new programs given the Dart's slow sales) and 3-pedal cars are not easy to come by. Autotrader currently has only 155 GTs with the 6MT in the entire country. However, if a manual is not a must there are plenty to choose from. Part of my job as a buyer's consultant is to give people options. I want them to be aware of what else can be had within their budget so they can make the most informed decision possible. If they still end up with their first pick, that is fine at least they did not do it blindly. So if you are determined to get the Mazda 3, I certainly don't blame you. However, if you want to keep some cash in your pocket and still enjoy your commute, I highly suggest you take the Dodge Dart for a test-drive. If there are any Dart owners who would like to share their experiences with the car, please do so in the comments. If you have any suggestions for future installments of "Lost in the Crowd," I would be happy to hear them.